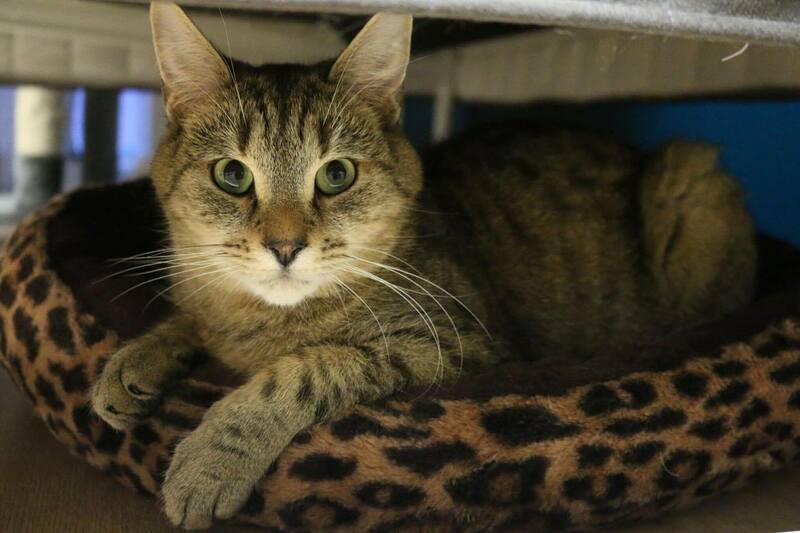 All of our cats and kittens are rescues which have come from local or over seas shelters and sanctuaries. 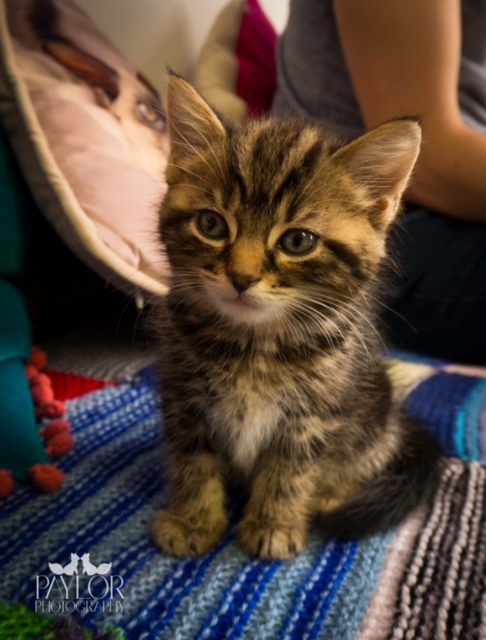 Gladys arrived at the café at just 8 weeks old, being the only kitten of her litter ready to leave the shelter. Don’t let her small size fool you though, she is slowly becoming the big boss around here and is giving Stan a run for his money! She loves nothing more than a good bound around the café after any toys she might discover, any cat tails she comes across and even sometimes her own tail. She is definitely a welcome addition into our little Mog family, and we think she will make a big impact on you lovely customers too! 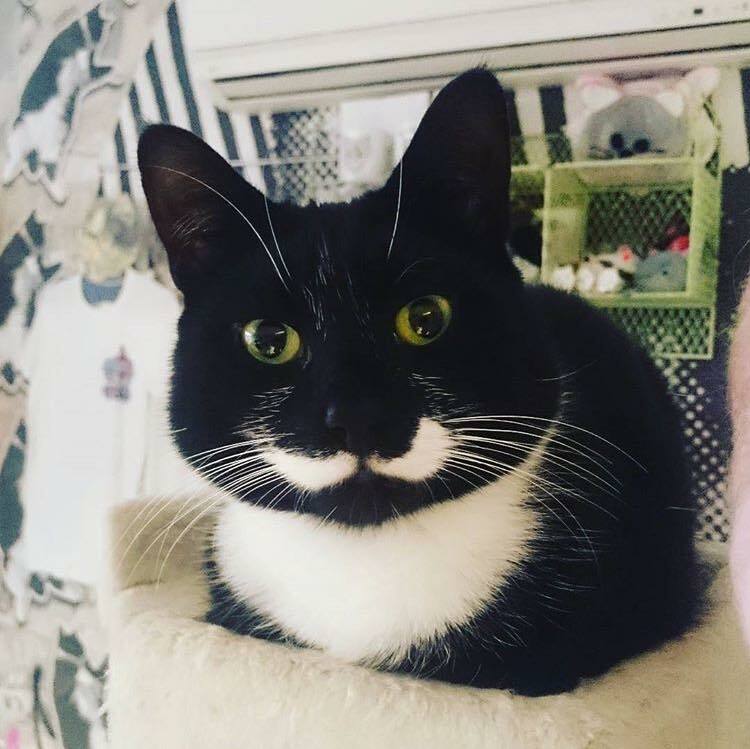 This handsome chap got his name because of his amazing white moustache! (And obviously he likes to wear a top hat and play poker in his spare time.) Sir Francis is the son to tortoise shell, Gizmo and everyday she wonders why her teenage son is still living at home. He’s a big softy, although he will silently judge you from a far – usually from the hanging bridge on the ceiling, where he will play fetch with you with a feather toy! It has been known, if you sit on the floor knee’s bent, he may wonder on to your lap!! Be warned for when Francis is in a very happy mood he will become a dribble machine, redecorating your favourite pair of jeans. Ballet arrived to the café with Wobble, they were both from an animal sanctuary in Thailand. 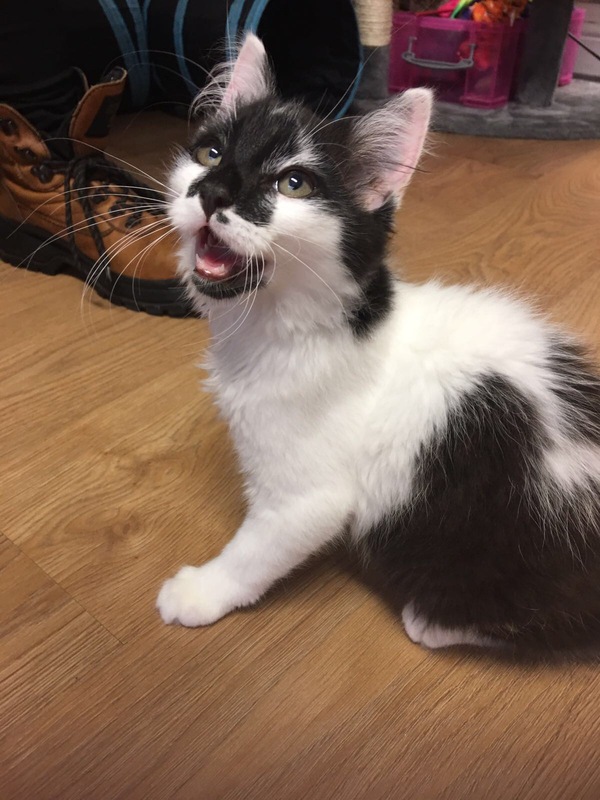 Our founder Katie fell in love with the 2 cats and was asked if she could bring them to the cat café, as they would get all the love and attention they needed right here at Mog on the Tyne. We raised money to bring the cats over, all money came from donations received from the amazing customers who came to Mog on the Tyne. Having Ballet and Wobble at the café ensures that they will have the best quality of life as possible. Both cats were born with a neurological disorder called Cerebellar Hypoplasia. You will see both cats being adorable wobbling about the café, but don’t worry they are both very happy and healthy cats, the neurological disorder they have is not progressive, they have both had the disorder since birth. 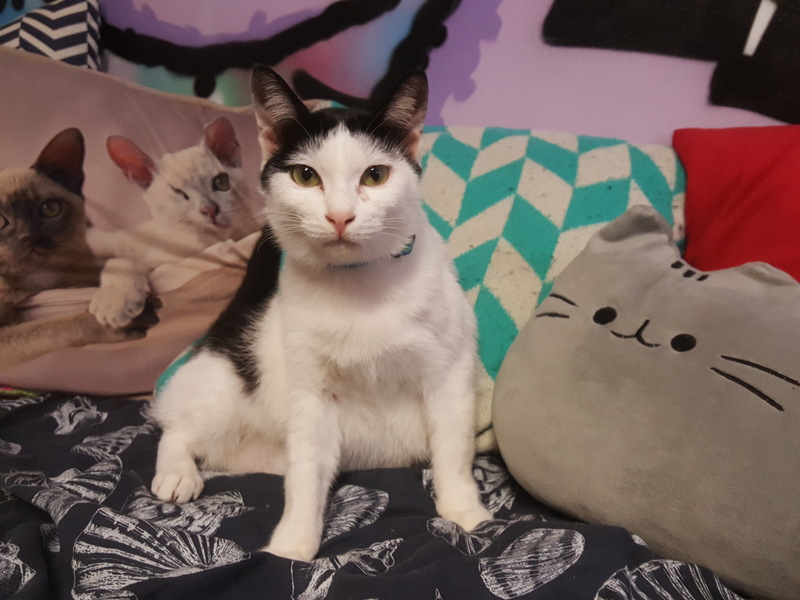 Ballet is a friendly kitty, she loves nothing more than settling down in a comfy place, usually on the settee, to have lots of stokes from all the customers, however Ballet is a very head strong kitty and will definitely will let you know what she has had enough cuddles. Wobble arrived to the café with Ballet, they were both from an animal sanctuary in Thailand. 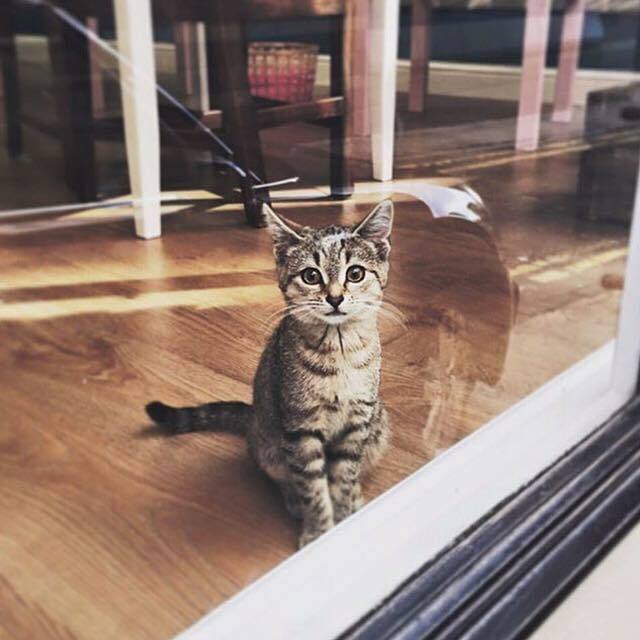 Our founder Katie fell in love with the 2 cats and was asked if she could bring them to the cat café, as they would get all the love and attention they needed right here at Mog on the Tyne. We raised money to bring the cats over, all money came from donations received from the amazing customers who came to Mog on the Tyne. Having Wobble and Ballet at the café ensures that they will have the best quality of life as possible. 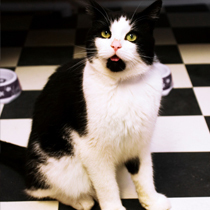 Both cats were born with a neurological disorder called Cerebellar Hypoplasia. You will see both cats being adorable wobbling about the café, but don’t worry they are both very happy and healthy cats, the neurological disorder they have is not progressive, they have both had the disorder since birth. Wobble is a very loving cat especially if he is sat on the settee, he will jump into many customers laps for nothing more than strokes. He is a little bit odd and will sometimes try and lick your fingers. Wobble is extremely playful when he is on the floor, he enjoys trying to catch many different cat toys, if he isn’t trying to catch a toy he will dive bomb into many different cat tunnels or tents. Meet Sybil, our female half bengal, tabby kitty. She’s a cute bundle of joy but don’t be fooled by her good looks – she may steal your belongings or give you a sassy paw if she’s not wanting a fuss! Our bengals are little thieves and love to snoop in your bag. She is seriously all about play time – especially when it involves pouncing on her brother Rum. You will probably find them snuggled up together. They tend to stick together a lot, it’s adorable! Sometimes she lets out a very high pitched meow (I’m hungry), and rum will always come running to make sure she’s okay! We just know you’ll fall in love with Rum, he’s addictive! 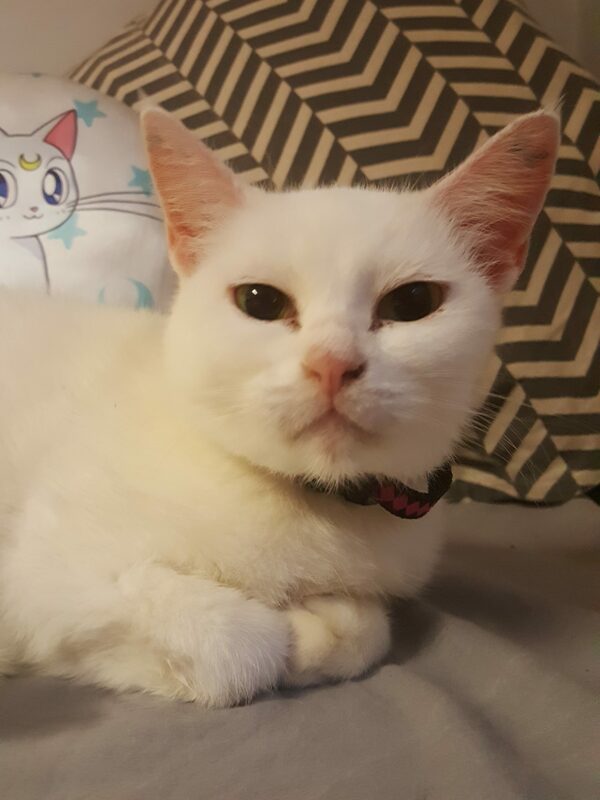 Our mammy cat! Gizmo is around 4 years old and so is a young mummy to our two black kittens; Maggie & Sir Francis which are both 2 and a half years old. Gizmo is probably the goofiest moggy you will ever meet, you can spot her doing her usual morning cardio on the cat wheel, spending the entire time meowing away. She is one of the more vocal cats in the café. If Gizmo isn’t keeping up with her workout routine you can usually find her snoozing next to a radiator or in a cat bed, after those hard hours running. Her party trick is catching a fly and eating it in one slow, cool swoop. She fully recognises her name so try calling her over and she will be impressed. Gizmo always bows her head for a stroke and is extremely friendly. She will look up at you with her big beautiful eyes and you won’t be able to resist! 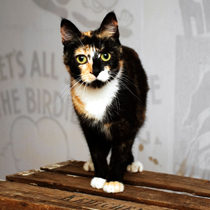 We especially love her two tone face and tortoise shell colouring which makes her extra unique.